TECHknitting blog is not about knitting rules, in fact quite the opposite--it's about knitter's choice. 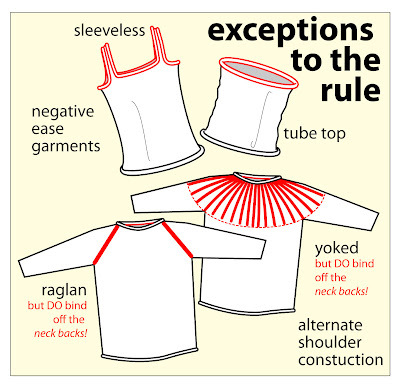 Yet if someone INSISTED that I HAD to state a rule, that rule would be to put a good sturdy seam across the shoulder tops and bind off the back of the neck of your knitted garment. You see, the shoulder tops and neck back are the foundation of every sweater. Stated otherwise, unless you live on a space station without gravity, the point of greatest contact between you and your sweater is the shoulder seams and back of the neck, because the whole garment hangs from there. 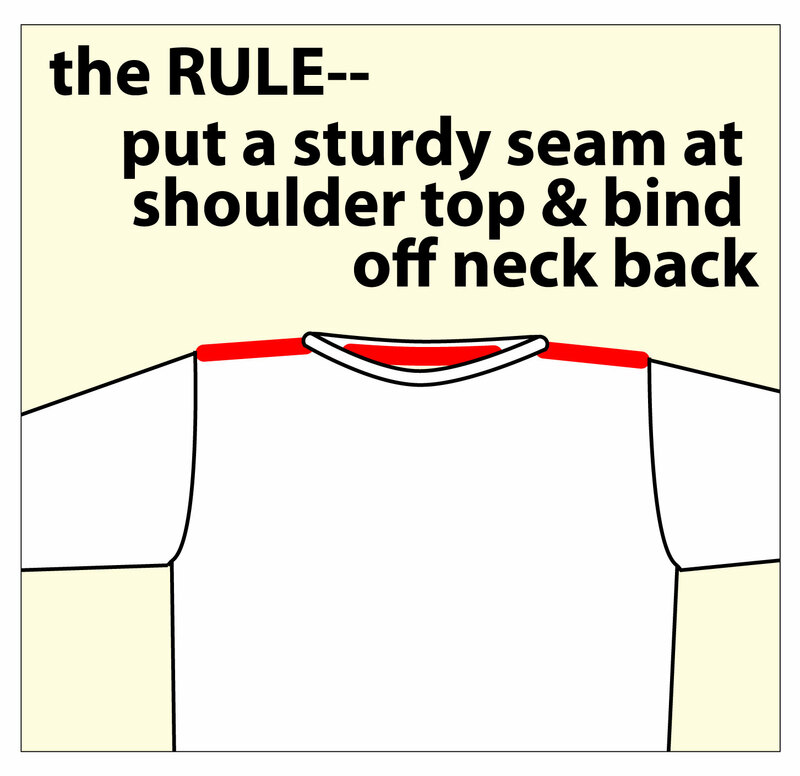 If the very top of the garment is yielding--if the neck back stretches out sideways and the shoulder seams are soft--then that garment will slip and slide from your shoulders and will never sit right. Although I say a good sturdy seam is a rule, like all rules, there are exceptions and partial exceptions. Tight garments with negative ease cling to the body and so need not have a sturdy shoulder--in fact the ultimate negative ease garment--the tube top--has no shoulders at all. In a very tight negative-ease sweater, there is very little weight hanging from the shoulder because it clings, rather than drapes. Sleeveless garments and backless garments are held up with shoulder straps or perhaps even a tie and have no shoulders. These, too, are often quite tight garments, and their cling, coupled with the scanty amount of fabric means that there is no particular weight to drag the garment down. Raglan sleeve garments, strictly speaking, do not have a shoulder seam either--they instead rely on 4 yoke seams radiating from neck to underarm to take the weight so no shoulder seam is needed. However, even these should have their neck backs bound off. Yoke-style sweaters don't have seams, either. Instead, their construction has radiating columns of knitting extending out from the neck hole like a sunburst, and this arrangement helps distribute the weight to hang from the neck facing. These too require no shoulder seams, but their neck backs should be bound off, especially since the neck seam is the target for all the weight of this style garment. Yet, although there are four exceptions to the "shoulder seam" rule (and probably more I'm overlooking) these are the kinds of exceptions which "prove the rule," as the saying goes. 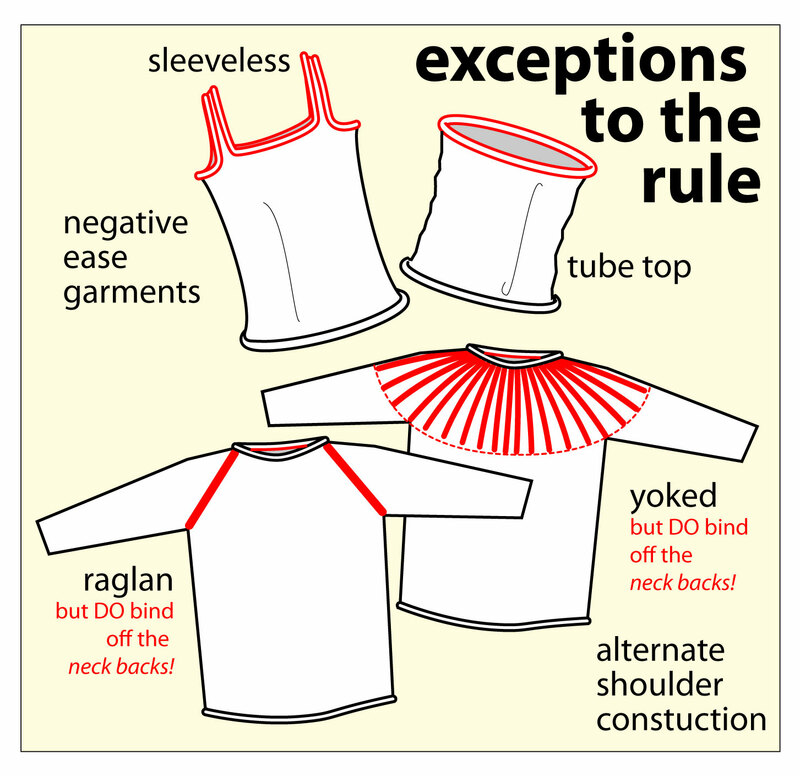 In other words, these exceptions show that the shoulder seam rule doesn't apply only when some OTHER measure is taken as a substitute. So, there must either be a way of getting around the seam, such as the four exceptions above, or there must be a good sturdy seam. Turning back to the slipping and sliding problem--how does it arise? Possibly the most common way to end up with a slipping sliding sweater to modify the directions for the back of the neck so that a collar or hood grows right out of the neck-back stitches, without any seam at all. In other words, what generally happens is that the pattern does call for the shoulders and neck back to be bound off, and then the collar or hood stitches to be picked up THROUGH the bound off stitches. Many knitters, faced with a pattern like that, come up with what seems a clever short cut to avoid binding off, then picking up the exact same stitches. "I will simply avoid that seam," thinks the knitter "and simply keep knitting the collar or hood to grow right out of the neck-back stitches," and so goes their way rejoicing at the labor saved. The rejoicing stops, however, when the garment is put on and the neck back stretches and stretches, rather than remaining seated as it ought. Of course, sometimes the pattern itself is at fault for not specifying a bind off and pick up along the neck back, but you are now too clever to follow such instructions. Melissa has written in the comments, asking about garments worked from the top down. Starting these with a permanent cast on is something of a gamble, tension-wise. IMHO, the best way to start these garments is with a provisional waste yarn cast on (called COWYAK--cast on with waste yarn and knit). At the end, cast the garment OFF at the top edge. This allows you to adjust the tension (more than once, if needed) for the neck opening, before going on with the neck band, collar or hood. 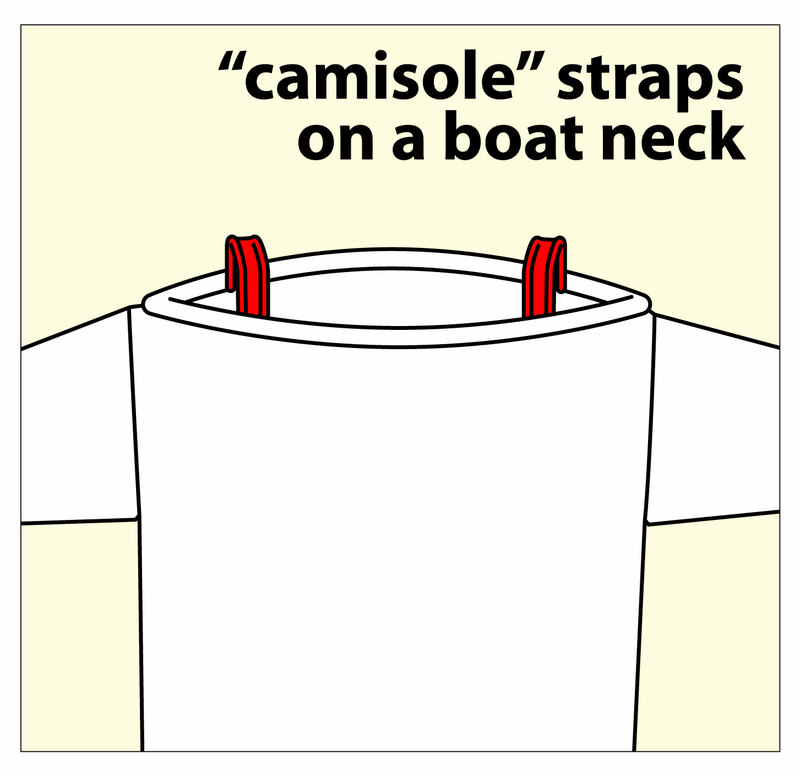 A boat collar (also called a slit-neck) is an example of a garment with a very large neck opening. These are lovely to show off the shoulder tops and collar bones of an Audrey Hepburn, but they can be the very devil to keep on straight, without having the garment slide off one shoulder or another. 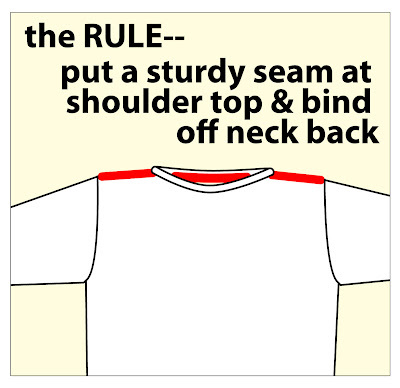 V-neck and scoop neck styles can suffer this also, especially when too many stitches are picked up around the neck opening, or when the neckband is not knit for enough rows (knit too shallow). Another common cause of slipping and sliding is when the knitter modifies the shoulder seams by succumbing to the temptation for pretty, and kitchener stitches (grafts) the shoulders tops together, rather than putting in a good sturdy seam. Kitchener stitch sure SEEMS like sewing--in fact, it is often done with a sewing needle. However, Kitchener stitching is actually KNITTING--the needle follows the path that a knitted row would take, and that is why it is so utterly invisible. Knitting is stretchy, and having knit fabric on the shoulder without a raglan seam or a yoke construction to take the weight results in a slipping slider that's hard to wear. Again, some patterns actually call for a grafted shoulder, but you are free to ignore such instructions and seam, instead. Now we come to a large category of knitting a slipping slider: when the construction of the garment is responsible for the problem. This category breaks down into (at least!!) five further subheads. When an entire sweater-coat is knit from heavy yarn, there is a real problem of keeping it seated at the neck and shoulders, regardless of any construction detail. The fact is, knitting stretches, even properly bound off and seamed knitting. 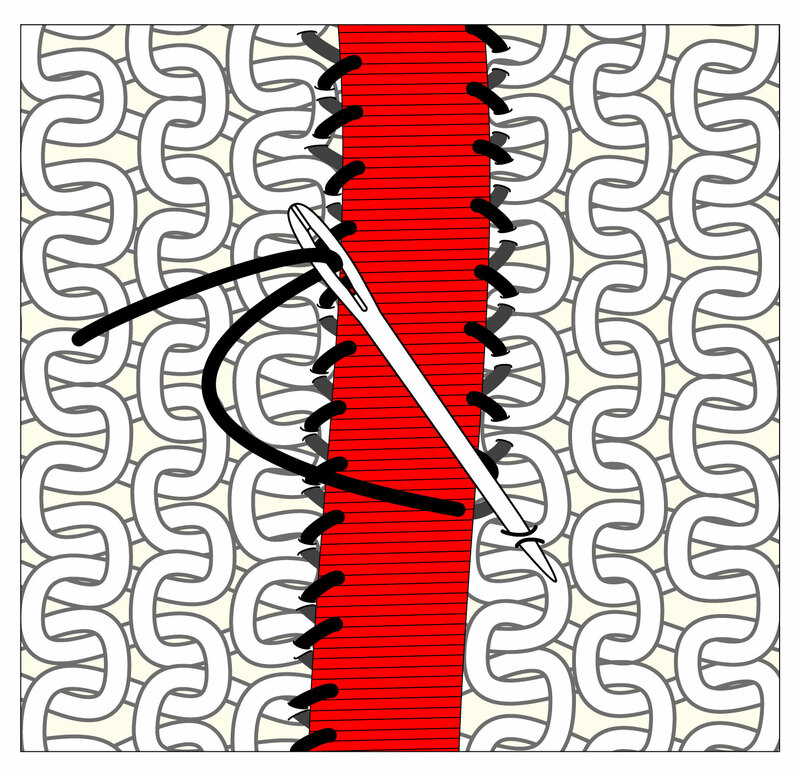 In this case, we knitters must borrow from tailors, and use their techniques--there is a description of reinforcement with a ribbon, below. Drop shoulder sweaters do HAVE shoulder seams, but no real shoulders. 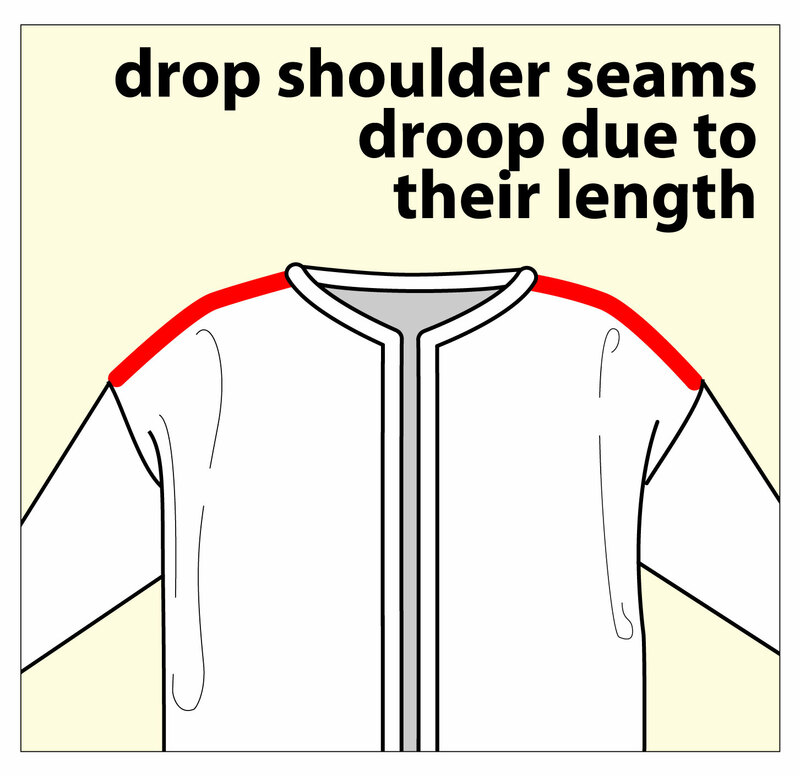 Stated otherwise, The "shoulder seams" are so long that they hang well off the shoulder. This, coupled with the bulk and weight of the sleeves themselves, drags the garment away from the wearer's neck on both sides. This is especially a problem when the garment is a cardigan, knit in heavy wool. Worn open, drop-shoulder cardigans tend to slide away. If combined with a soft neck back (collar knit right out of the neck back stitches, for example) the result can be nearly unwearable. This innovative garment construction technique is sort of like wearing a round tablecloth with arms inserted. The upside is a beautiful radiating pattern, often with a lovely circle motif centered on the wearer's back and lovely falls and folds of fabric cascading down the fronts. 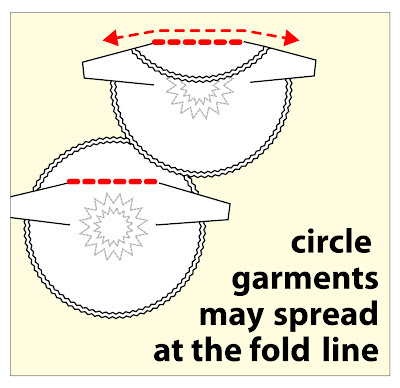 The downside is often no shoulder seam at all--the top edge of the tablecloth is flipped back for a collar, and the shoulder line is formed at the fold. This fold may prove to be very soft and yielding. Some patterns get around this by having the circle truncated at the shoulder line, and then a collar added afterwards, some have other work-arounds, but many of these circle-knit garments offer a pretty fair dose of the slipping-problem. Cuff-to-cuff garments are fun to knit and offer a truly organic method of getting vertical stripes in a hand knit garment without having to knit intarsia bobbin-work, or fair-isle color work. 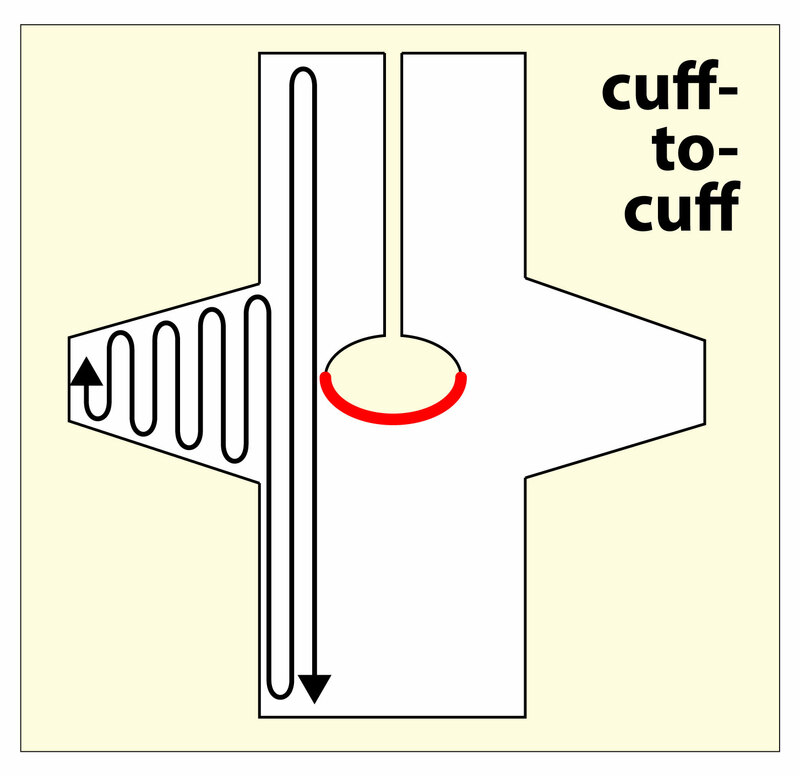 Yet, when a garment is knit cuff-to-cuff, there is nearly never a shoulder seam because the whole point of the garment is to knit it sideways, each row extending over the shoulder from one bottom edge to the other, then back again. The neck-back must be bound off--it is the fabric selvedge, shown in red below--so these garments aren't quite as loose as circle knit garments, yet nonetheless, cuff-to-cuff sweaters can offer a pretty high dose of slipping and sliding. Sometimes patterns are offered for garment with dolman sleeves, knit bottom-to-top, then grafted shut along the long sleeve-top seam and right along the shoulder too. 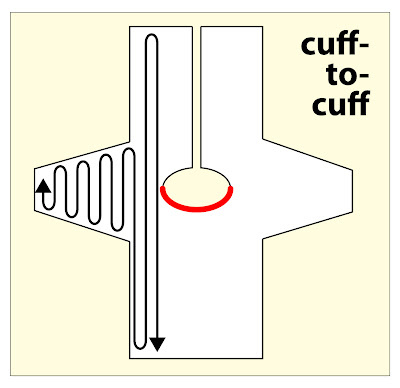 Like the cuff-to-cuff, such a design usually offers at least some firmness along the shoulder line by having the back of the neck bound off, but can also suffer from sliding. The simplest, most time-tested solution is either to create a sturdy seam at the shoulder PLUS bind off the neck back OR to knit a garment from the "exception" list such as yoked or raglan. Yet, this is no help if you've already knit a slipping slider, or if you simply adore a garment construction which inherently slips and slides. This is probably the easiest fix for an already-made sweater which wants to slip and slide off the shoulders. Run a line of non-stretching yarn across the top of the shoulders and the back of the neck. This is usually done with a crochet hook, applying the yarn in a slip stitch. Here is a TECHknitting post about crocheting for knitters, which includes information about how to work the slip stitch. TECHknitting blog has also covered slip stitching in the context of firming the stretchy edge of a garter stitch scarf, and the idea is identical here. Rather than traveling along the edge of the fabric, however, the slip stitch is worked across the back of the neck and the top of the shoulders. 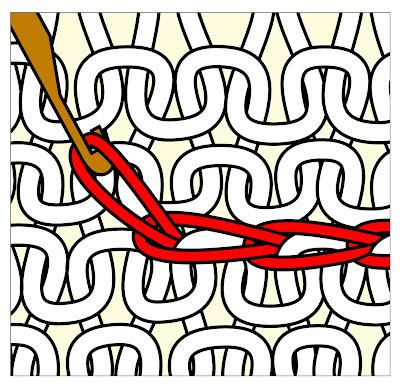 Below is an illustration showing a line of slip stitch worked across the interior of a knit fabric. There is nothing to stop you from running two or even more parallel lines of slip stitch if the garment requires--a large shawl collar rising directly out of a neck back, for example, or a circle knit garment with no other provision in the pattern for a shoulder seam. PS: the slip stitch trick works pretty well to tighten other loose parts too: sweater and mitten cuffs, loose and floppy bottom bands, hats too large and so on. Another traditional method, although now not much used, is to sew in a line of grosgrain ribbon or twill fabric tape along the shoulder seam. 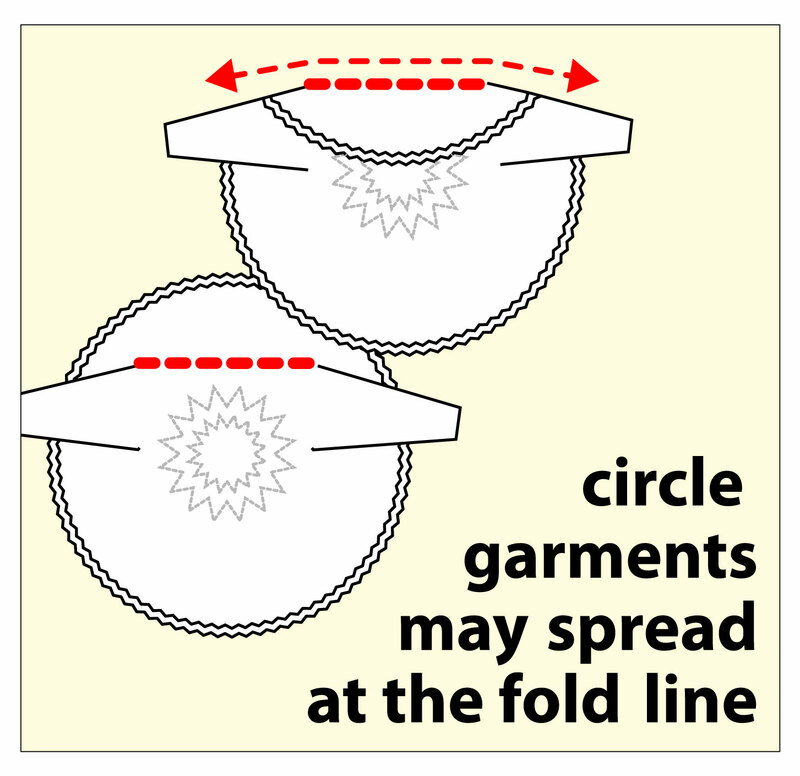 In a modern variation, the shoulder seam on garments made of commercially knit fabric is serged together with a narrow strip of fabric tape (sheer or twill) serged in along the seam also for a three-layer fabric sandwich. The ribbon/tape prevents stretching, helps distribute the stress and generally preserves the garment--we have quite old sweaters in our family which incorporate a ribbon and these have held up well over the years. The stitch to use for sewing the ribbon or the tape along the shoulder top is the overcast stitch, worked in little tiny stitches all along both long edges of the ribbon, pushing the sewing needle through the plies (split the plies) of the yarn so that the stitches do not show on the outside. This is the method I would use to correct the droop and stretch of a garment previously grafted (rather than seamed) shut at the shoulder. This is also a good trick for a drop shoulder garment. If too many stitches were picked up around the neck opening, OR if the neck band was knit too high (too many rows/rounds) without sufficient decreases, the result is the same: A ruffling and loose neck band. This is tedious to fix, but hardly difficult: pull out (frog) the band and do it again, on fewer stitches or with more decreases. Another recipe for a too-large neck opening is when the neck band was knit too shallow (too few rows/rounds). The cure is easy: Take out the bind-off, and add a few more rows or rounds, remembering to add decreases when appropriate. This cure will surely work, regardless of the original size of the neck opening--you can work the neck band as high as needed: at the extreme, you can build the neck up into a mock turtleneck or even a full turtle neck--maybe not what you set out to make, but these neck styles are certainly not going let the garment slide around. For a slit neck which will not stay put, consider sewing in two little ribbons, one on each side of the neck. Alternatively, knit two short little straps and sew one in to the inside on either side of the neck. Where these ribbons or knit straps peek out at the shoulder, they will look like camisole straps. 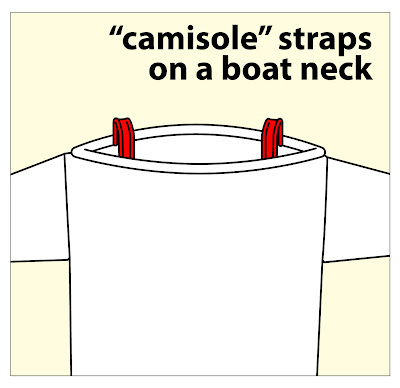 Either of these cures will surely cure "slide-itis" in your boat necks. Slip stitch: first bind off each shoulder using the ordinary chain bind off, then slip stitch the shoulder seams shut from the inside (this is the same slip stitch as the "neat little edging," or the slip stitch illustrated above, only worked through both layers of fabric at the shoulder top). This information is also shown (illustrated through both layeres) in this post about crocheting for knitters. Back stitch: first bind off each shoulder using the ordinary chain bind off, then simply sew the shoulder seam shut from the inside using the back stitch and working through both layers of fabric at the shoulder top. 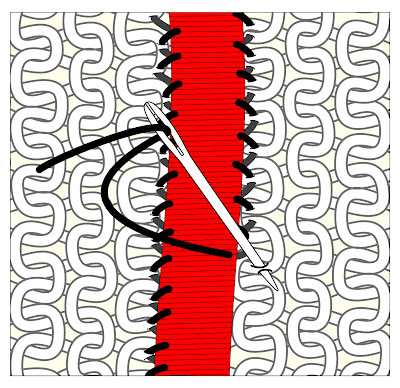 Use a dull-pointed needle and work between the stitches, not through the plies. Use the three-needle bind off: for this trick, hold the live stitches for each shoulder together on their two needles, the front fabric face of each piece touching, then use a third needle to bind off through two stitches (one from the front needle, one from the back needle) at the same time. 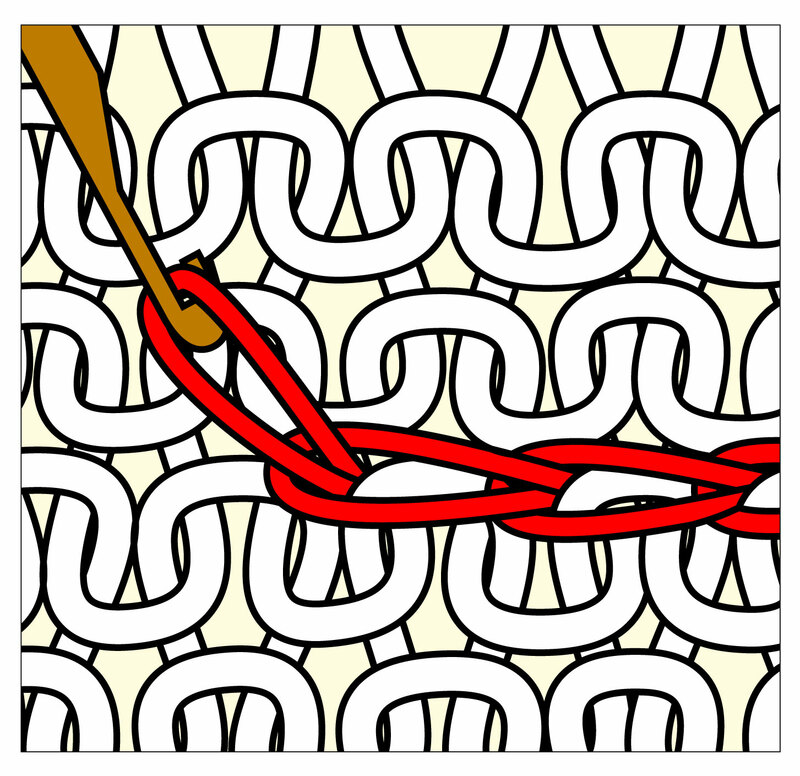 For further information, go to the illustrated post about three needle bind off.